On the first day, we participated in a mock crisis drill and a few panel discussions. We had a small group discussion with The Fabulous Beekman Boys, two New York City men who bought a farm. This was a very different perspective for us to hear and learn from. We also participated in a panel discussion with the United States Secretary of Agriculture Tom Vilsack. Afterwards, Vilsack met with the students in attendance to answer questions and take a photo. 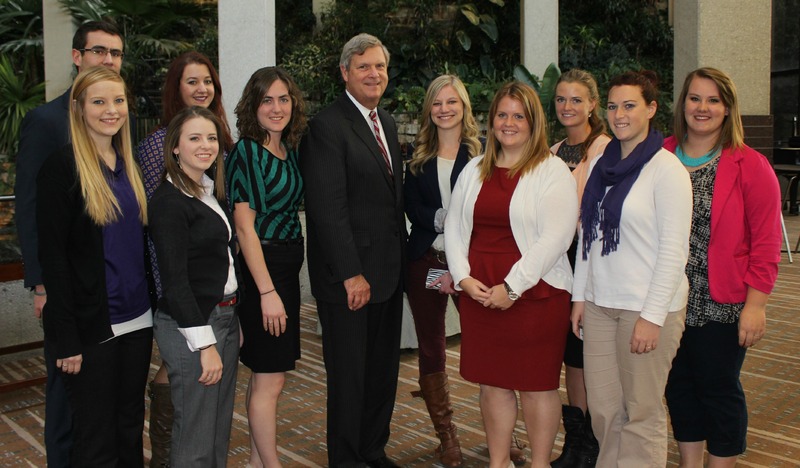 Secretary of Agriculture Tom Vilsack poses with students at the 2014 NAFB conference. 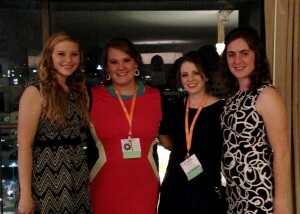 NAFB is expanding the student portion of the conference, and the national officer team was excited to be a part of it. The NAFB planned a few sessions especially for students, giving us a chance to leave the conference scene for a bit and discuss a few topics more in-depth, including backpack journalism and dinner etiquette. Throughout the conference, we networked with professionals in the broadcast industry who shared their career insights with us. It was also a unique experience for us to see the legends in this industry be recognized for their accomplishments. The national ACT officers and our advisor stayed for a few days after the conference to meet and discuss the upcoming ACT professional development conference in Florida, goals for the year and revisions to the website and other social media. We also planned ahead for our role at AMS this summer in Scottsdale, Arizona. So far, my experience as a national officer has been great. The team has discovered just how difficult it can be to plan via conference calls, Skype and emails. Despite the challenges, we continue to work hard to give back to the ACT organization. Through ACT, I have been able to engage with professionals in the industry I hope to join in just five short months. Building these connections as a student has allowed me to have amazing internships and many great experiences. As a national officer, I am excited to travel and make even stronger connections with professionals and students from across the nation. My team and I look forward to more bonding and meeting more members from across the nation during a warm week in Orlando, Florida, January 15-17, 2015. To learn more about ACT, visit NACTnow.org. We are always looking for more ways to connect with alumni. We would love you to hear from you!